Following a scene of pompous and seemingly victorious car parade, I.N is seen whispering into a walkie-talkie. 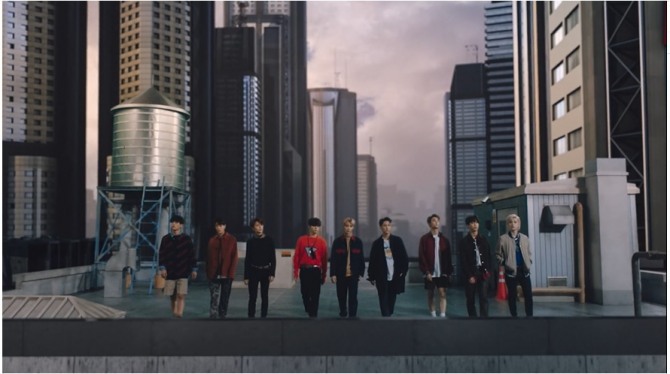 All nine members are seen briefly on a rooftop in an urban jungle in the 40-seond trailer filled with dramatic sounds and gripping visuals. The music video will be available in full at midnight on March 25 celebrating the first anniversary of the team’s debut. EP “Cle 1: Miroh” will have eight titles and be released at 6 p.m. on the same day. Watch the clip at https://www.vlive.tv/video/119607. Four members of BTOB gathered to thank the fans on the seventh anniversary of their debut. “Although all seven are not here this is a very important day,” said Hyunsik. Three members of the group are currently serving their military duties. Peniel, Ilhoon and Sungjae joined him and acknowledging that they have not seen each other for quite a bit. 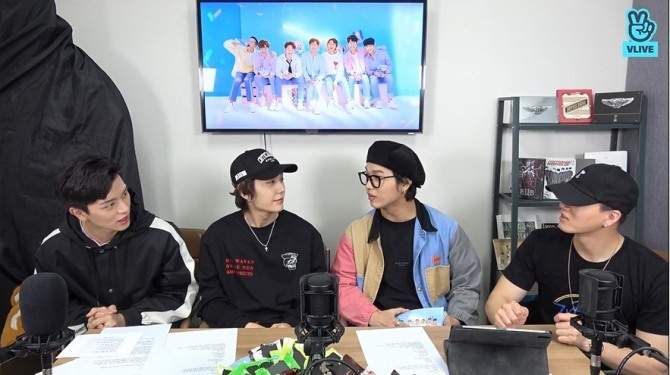 Peniel and Ilhoon reported that they both are doing radio programs while Hyunsik said he has been staying at home recently. “I have not been cutting my hair or shaving. I try to work on new songs but it’s not going well,” he said with mock seriousness. Sungjae has been appearing in an entertainment program in which an audition tape of him at 14 was aired. “I remember meeting him around that time. He hasn’t changed a bit,” said Hyunsik. This led to how they cannot believe that they met almost a decade ago and the group has been around for a full seven years. After a round of games that picked the youngest Sungjae as the leader, the band vowed that they would do their best and be there for the fans to celebrate the 70th anniversary. Watch the full clip at https://www.vlive.tv/video/119230. Twice members had to shout out words to each other as they played a game on “Star Road” at Naver’s V Live. Each was given a headphone with music blasting and was asked to guess given words their partner was mouthing. Dahyun got all questions right including soddeoksoddeok, a popular snack of sausage and rice cake on a skewer. Momo, however, managed to get only two before she ran out of time. Sana started off her turn shaking her body to the music from the headphones but it was harder for her and Tzuyu, both non-native speakers of Korean. Trying to guess the answers, their voices grew louder and louder and Dahyun had to let them pass some words while Sana threw random words. “It must be so hard if foreigners played this game,” said Momo watching the two. Watch the full clip at https://www.vlive.tv/video/116210. Who will be the next Kang Daniel? All candidates for the much-hyped audition program Produce 101 were seen at a photo op hailing the beginning of the fourth season. Bowing and waving to the media and public 101 boys stood in front of the cameras donned in blue uniforms for a mini fan meet. 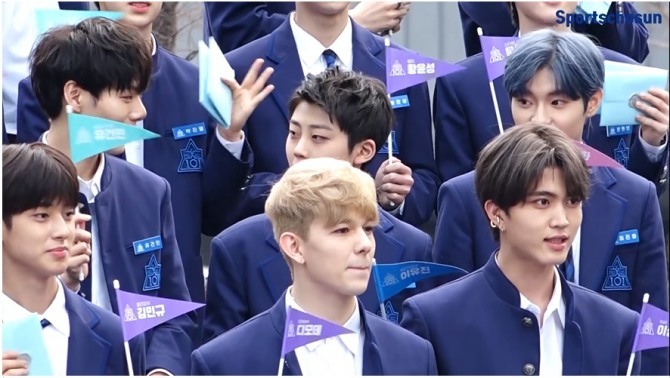 Members of boy bands such as Victon, Up10tion, In2It and Myteen as well as actors Lee Yu-jin (from recent hit drama Sky Castle) and Park Sun-ho are participating in the show. Son Dong-pyo, a trainee at DSP Media, took the center at their debut performance today unveiling the season’s title song “_jima” on Mnet. Actor Lee Dong-wook will lead the program joined by trainers including Cheetah. The fourth season will premiere on May 3. Watch the video at https://www.vlive.tv/video/119536.